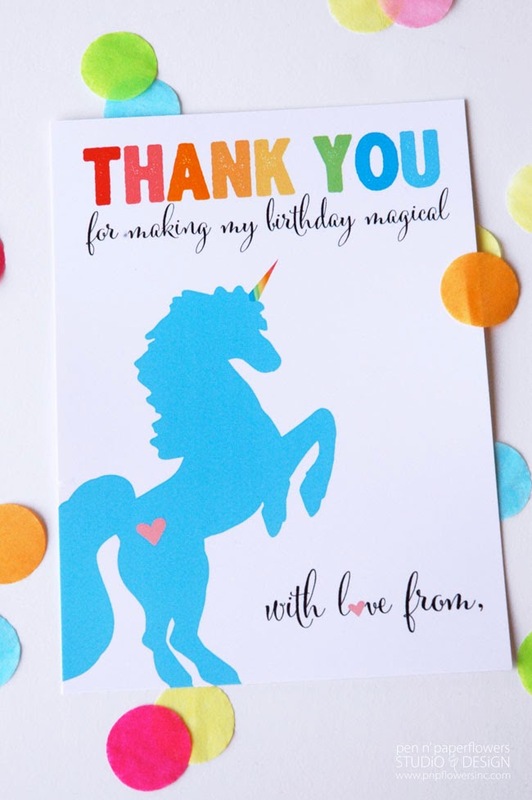 If you were wondering how I put together the Rainbow Unicorn Thank You Cards I first showed you last week…I've got all of the details for you today. 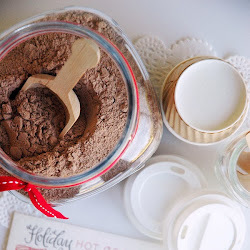 It's not a complicated process at all but I wanted to share with you some insight into the reasons I packaged it just in case you decide to recreate these yourself. 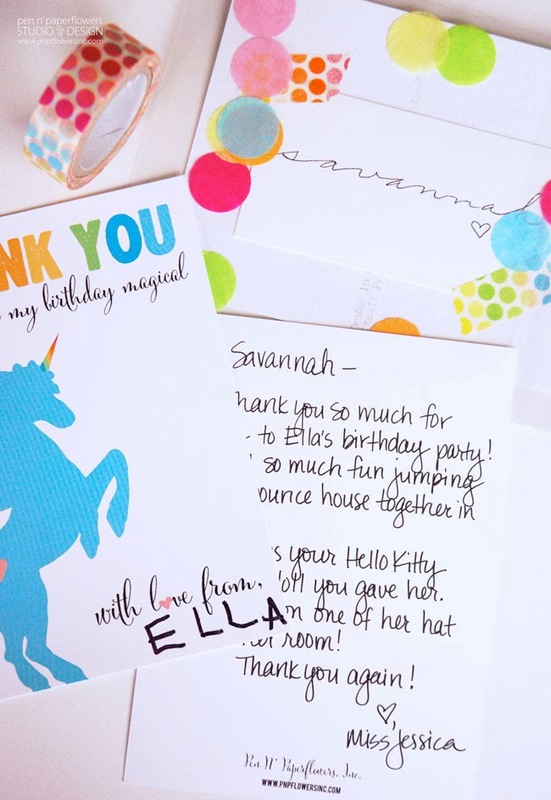 I knew I wanted clear envelopes because I wanted the coordinating confetti to show along with the fun graphic of the Thank You Card - and Ella's cute signature. However, because I didn't want Ella's photo to show for everyone at the Post Office to see I just put it face down against the backside of the Thank You Card. 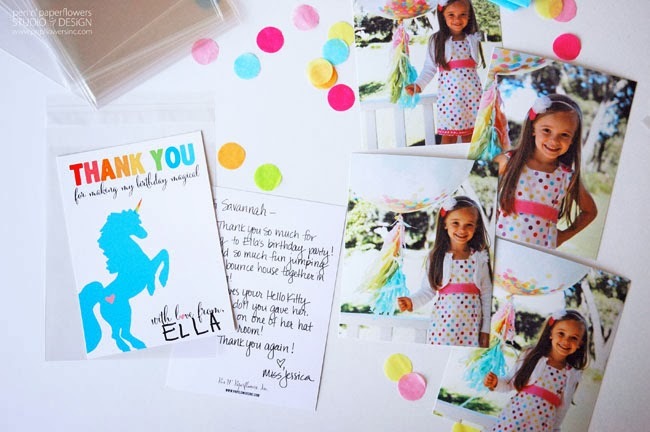 (If you are concerned that the ink from your handwritten personalized message on your Thank You Card will transfer to your photo during the mailing process you can insert a thin piece of tissue paper trimmed to size to put between the ink and photo to help protect it). I didn't need to do that because I wrote the cards at least a week before I finally inserted the photos and got them mailed out - so the ink was good and dry. 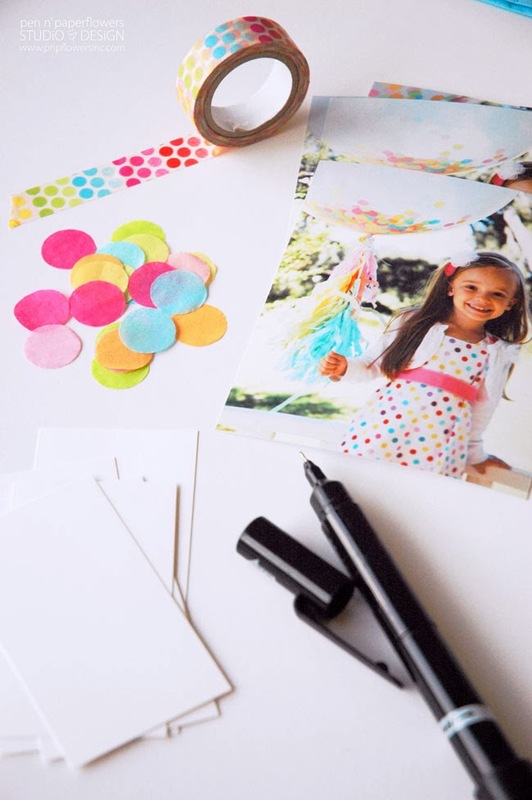 I chose to use a 3/4" Paper Punch for the Thank You Card Confetti but you could use any size you want! 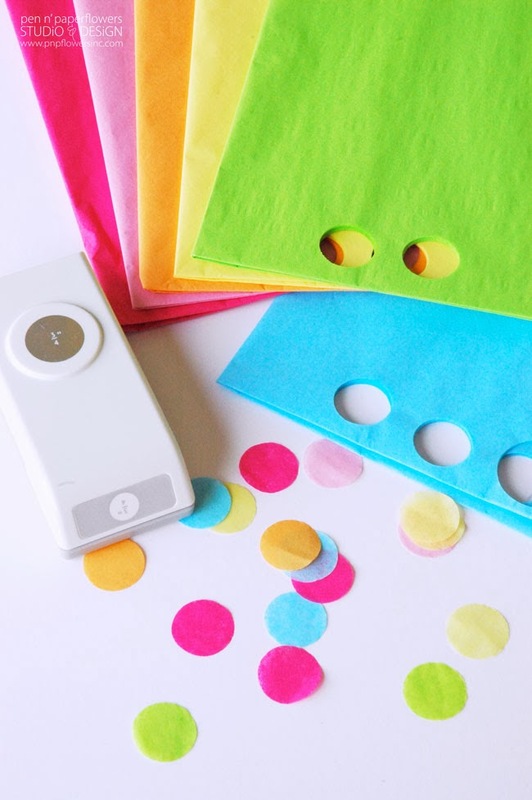 The tissue confetti used to fill the inside of Ella's Birthday Balloon was created with a 1" circle paper punch - which was just a little bit bigger and to be honest…I bought the balloon confetti pre-punched from Shop Sweet Lulu. I also happened to purchase the bundle of assorted tissue paper seen below from the same place and then made my own for the Thank You Cards. Choosing which photo of Ella to include with the Thank You Card was the hardest part for me. I ended up just letting Ella decide! Which helped keep her involved in the whole Thank You Card process. 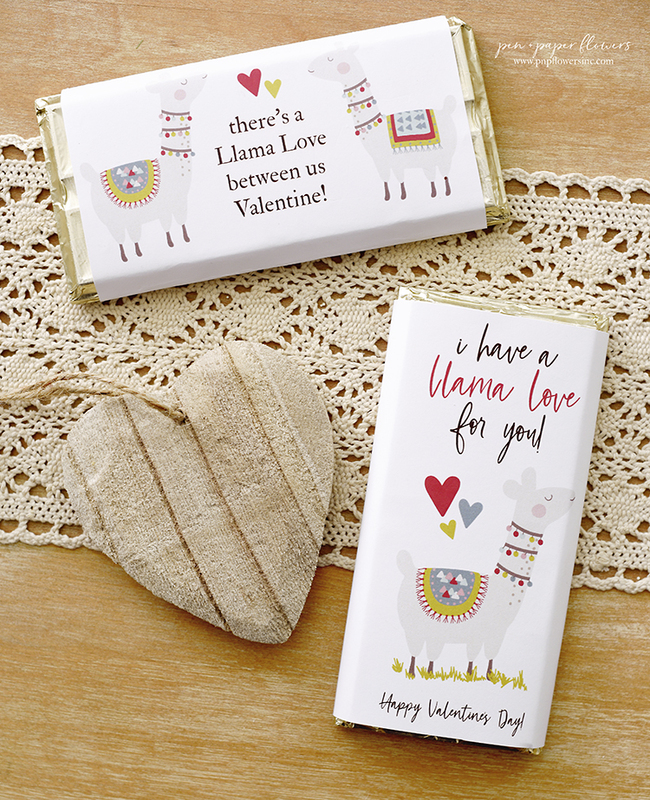 Originally I was going to just use shipping labels for addressing the envelopes, (and you could totally do that), BUT…I wanted to use a little washi tape as an accent and I wasn't sure if it would stay attached to the outside of the envelope. So, I had a really old package of leftover blank business cards (the ones that you use for printing your own business cards from home - does anyone do that anymore?). If the Thank You Card was being hand-delivered then I only wrote the person's name. (as seen below). 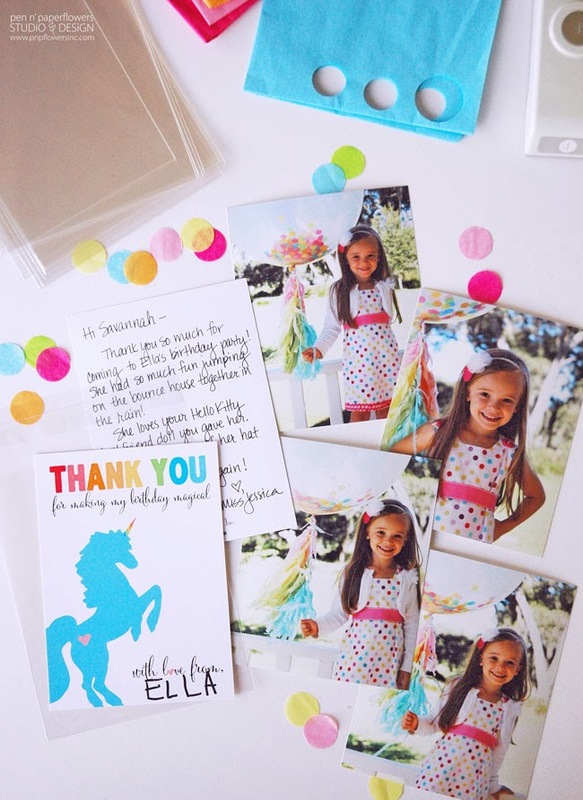 I taped the addressed blank business cards to the back of Ella's photo using the cute washi tape. I slid it into the envelope and then added the confetti. I liked the size of this confetti because it wasn't too small - which would have more of a potential to cause a mess upon opening…if you know what I mean! I LOVE snail mail, people! It's absolutely one of my favorite things. 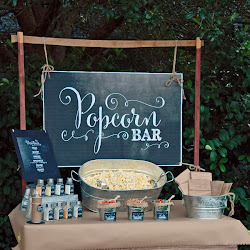 And I especially love preparing invitations and the such in a fun, fabulous way. It will never get old for me. Seriously. This technique is simple yet significant. (if you saw my Instagram post today you'd know exactly what that means). 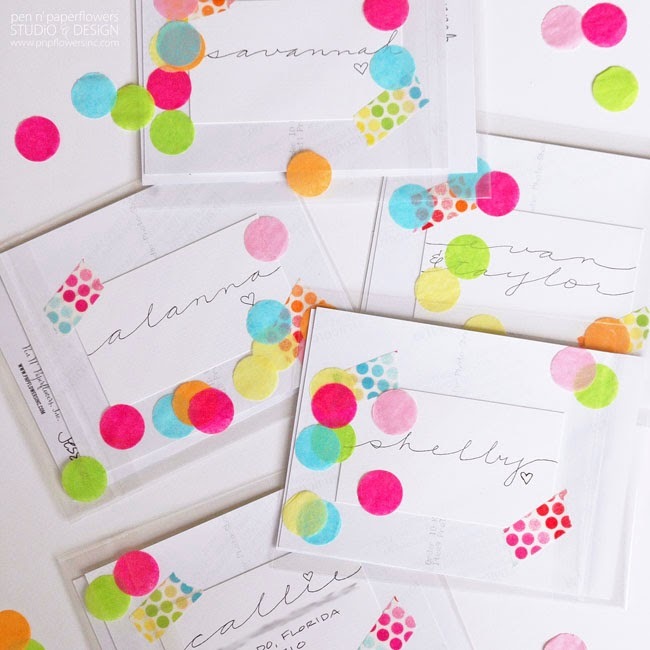 I hope you'll get yourself some clear envelopes for mailing out your next set of invitations or thank you cards. Love them! I had a wonderful Valentine's Day weekend by the way. I hope you all did too. Aside from being spoiled with gift cards to some of my favorite places, J and I enjoyed a last-minute dinner at a local Italian restaurant that proved to be exceptional. While we were out, Ella was at the church fully engaged in making cupcakes and cards to present to us when we returned. So sweet. Clara planned a big fancy night out with her girlfriends that don't have boyfriends. *wink* They got all dressed up and had dinner together at Olive Garden before heading out to see the new movie Endless Summer. She even went and got a pedicure and manicure for the big night along with a new dress! I just LOVE that she did that. 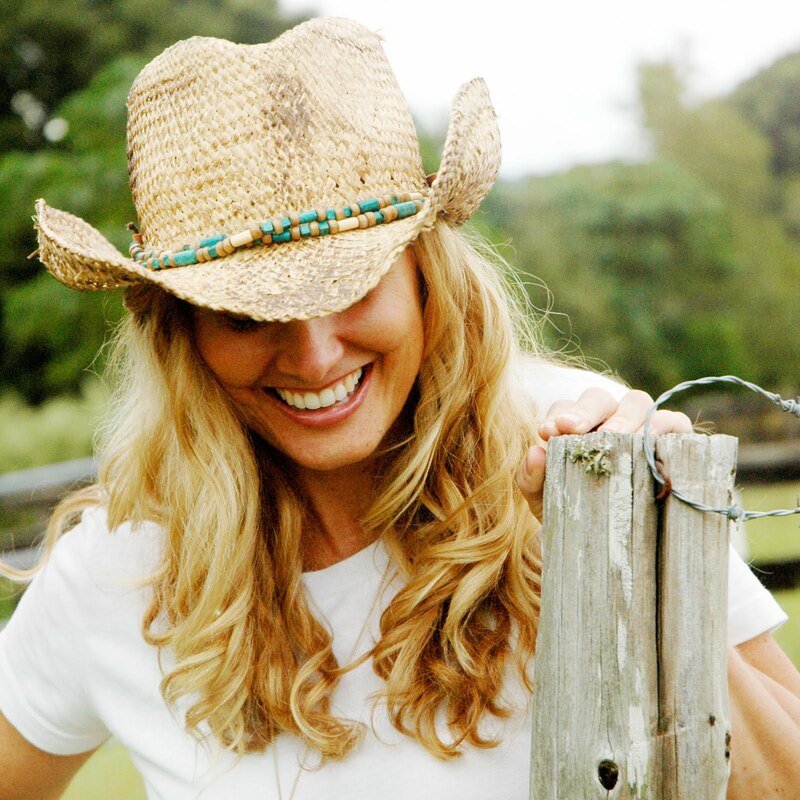 She had it planned for months and was so excited about it and get this…she paid for every single cent of it! I will be sharing the sweet details from the "memory-making event" Ella and J had together on Saturday night! Stay tuned! These cards are really so nice! And Ella is so "pinch-her-cheeks" cute, too! My favorite element is the confetti - so simple but it makes such an impact. Thank you kansasgirl1 - I so appreciate your comment and I love that you love the confetti! It's so easy too! These cards are so adorable yet doable... I really like the confetti! Confetti can be so messy sometimes but you made it elegant! Thanks Kelly! I'm so happy you liked them - and the confetti too! The bigger confetti is definitely more manageable!